79. What are the different types of sandboxes in salesforce ? 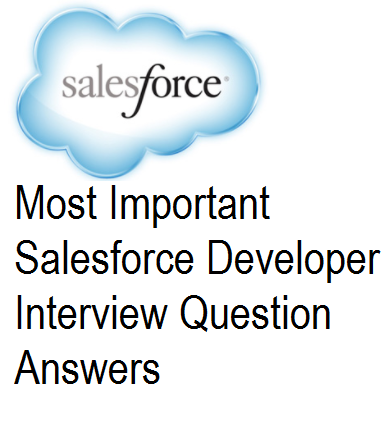 Ans: Developer, Developer Pro, Partial Data and Full are the 4 types of sandboxes in salesforce. 80. With what frequency can you refresh a full copy sandbox? Ans: full copy sandbox can be refreshed every 29 days from production. 81. How can you make fields required on a visualforce page? 82. What is minimum coverage for every trigger for deployment? 83. What is minimum coverage for every class for deployment? 84. How can you implement custom functionality for a standardcontroller visualforce page? Ans: This can be done by associating a controller class with that standard controller using "Extenssions"
85. How can you get the current record id in a visualforce page ? Ans use ApexPages.CurrentPage().getparameters().get('id') to get the current record id in visaulforce page. 86. Can a user change his own profile in salesforce ? Ans: No, a user cannot change change his own profile !! 87. Can a user change his own role? Ans: Yes this can be done !! 88. Reset security token option is unavailabel in set up. What could be the reason? Ans: If in the profile setting "login ip ranges" have been set up then the option of "reset security token" is uanvailbale. 89. How can you skip record type selection page(and take up default record type) while creating new record of a aprticular object ? 90. What are the different data types that a standard field record name can have? nice questions for interview point.